All the rights which are for user are for web log in but POS rights are accessible in IOS module. All POS rights would reflect in Application after restart application. Every time need to restart app when user change rights. Sign in with your log in id. 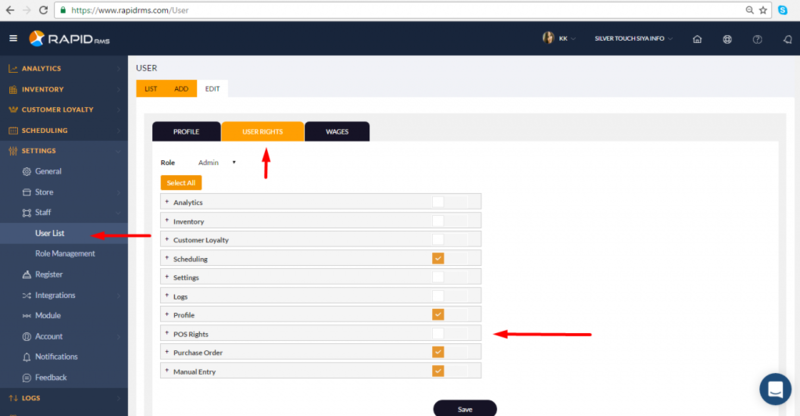 Go to setting -> staff -> user list -> edit user -> user rights -> POS rights. First rights is for cash register. When this option is selected then user is allowed to access cash register in IOS application. Change price is reflect in price of item. When this right is restricted that means user is not allow to change price via swipe item. Discount is for restriction to apply discount. In cash register we are applying discount manually. But if discount right is restricted then user is not allow to apply discount manually in At the time of billing. Tax is for apply/remove tax from item in pos screen. Tax right is applicable means user is allow to add and remove tax via swipe at the billing time. Cancel invoice is for cancel transaction. If User have don’t rights for bill cancelation, then after start invoice user not allow to cancel transaction. Delete hold invoice is for access of delete authority of delete hold transaction. If user have do not have this rights then user is not able to delete hold transaction from recall in POS screen. Customer loyalty is for access of customer loyalty module. When customer loyalty is not accessible then user is not allow to use customer loyalty module from IOS application. Daily reports are rights for the daily report module. X report is restricted that means from daily report user is not allow to open x report page. Z report is right for the restriction of applying Z report. If z report option is checked then only user is allow to apply Z otherwise not. 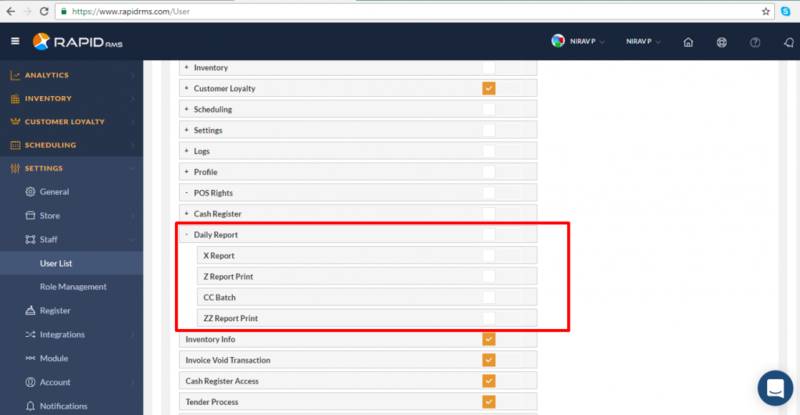 ZZ report is right for the applying ZZ report. If ZZ report right is restricted, then user is not allow to apply ZZ report from daily report. CC Batch is right for cc batch open. If cc batch right is restricted, then user is not allowed to open cc batch section. Inventory info is right for the access of inventory management module. If user have this right then only he is allow to access inventory management module otherwise not. Invoice void transaction is right for the void transaction. If you don’t have this rights then you are not allow to do any of transaction void. Cash register is right for the cash register module access. This rights is for ticket validation portion. When tickets right is off then User is not allow to access ticket validation module. And also in POS screen ticket validation option is restricted. This is right for the clock in out module. User is allow to access clock in out module by permission of this right. This right is for shift in out module. If user have restriction of shift in out module then user is not allow to access shift in out module from IOS application. Manual entry is right for the manual entry module access. POS setting is the right for setting access. When user have permission of setting then only user can open setting of rapid rms if don’t have rights then user get message for the restriction.